Isn’t it everyone’s dream to own a 22 foot high robot? It was Michael Salter’s dream until he recently made it reality. But did he use metal? No. Aluminum? Nope. 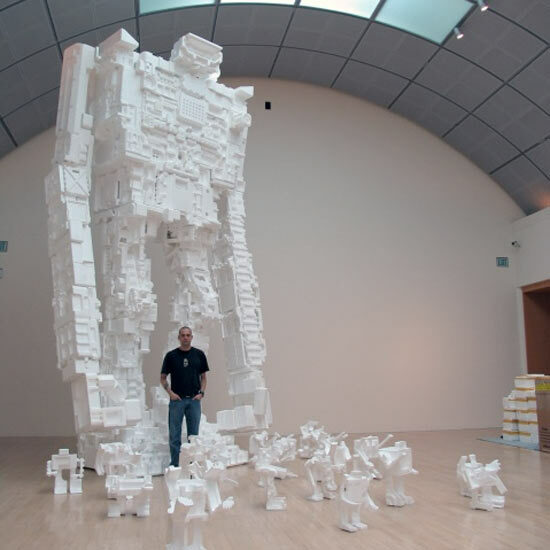 He made his dream robot out of discarded styrofoam. This robot is on exhibit at the San Jose Art Museum. What’s funny is that Salter didn’t even know if the robot was going to stand when he built it. He assembled the body parts at his home, and brought the robot by truck to San Jose. The styrofoam pieces are held together by a wooden skeleton. After making it to the museum, and assembling it, luckily, it stood. Talk about recycling old styrofoam.